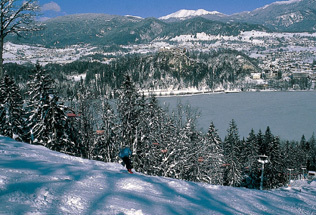 Chairlift to the Straža Hill was the first tourist cableway in Slovenia after the second world war. In that time the company called "Žičnica" (Cableway) from Ljubljana was planning and installing only cableways for business use (forestry, delivery, etc.). 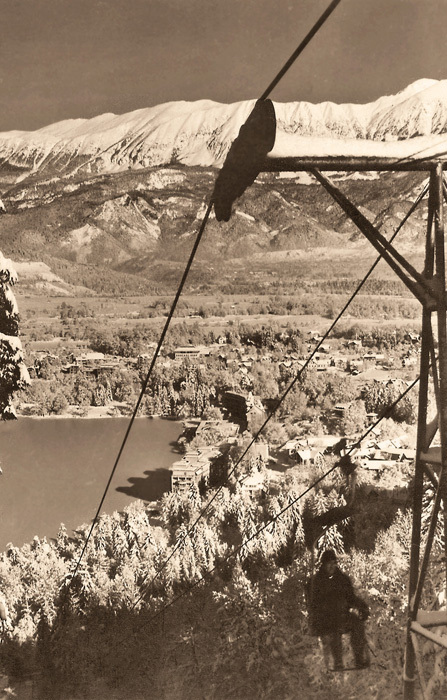 The company wanted to expand its portfolio to a production of cableways for personal use and thus in 1953 in Ljubljana Exhibition and Convention Centre introduced the chairlift prototype. The representatives of the municipality of Bled and the Tourist Society of Bled were impressed over that prototype and they also agreed it was suitable for the Straža Hill. Financially favourable agreement was reached as the chairlift operation would also mean a good promotion for the company. The company's representative Mr. Aleksander Kostenapfel, Chief Engineering Officer, prepared all necessary projects after the agreement and supervised construction and installation from beginning to the end. Pillars were installed by a local construction company. Chairlift to the Straža ski slope was opened in January 1954. This represented the first step toward more active development of tourist infrastructure in Bled. In summer the chairlift was used by hikers for walks on this beautiful viewpoint and in winter for winter sport activities if the weather conditions were appropriate as the top of the Straža Hill is only 646 m above sea level. According to statistical data the capacity of the chairlift in the first decade of operation was 28,000 person per year. 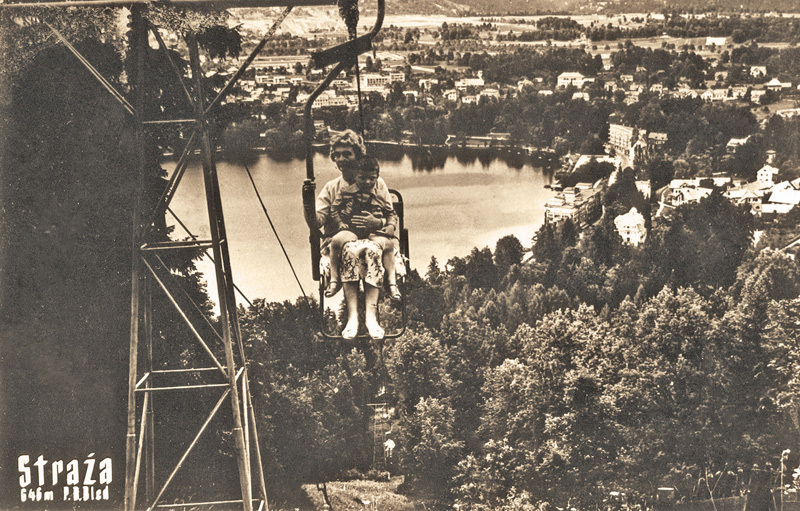 In the winter of 1964/1965 the Tourist Society of Bled financed the installation of the smaller rope tow ski lift on the grassy slope of "Mala Straža" (Little Straža Hill) which operated only a few years. Moreover, problems with the outdated chairlift engine house continued. These problems eventually caused ceasing of chairlift operation in 1972. A completely new chairlift was installed on the same place in 1989 and in 1992 a new rope tow ski lift. The ground on the ski track was corrected and expanded , and a brand new lower station of chairlift was also built. Ski slope lighting equipment was also installed that enabled night skiing. Finally in the 1990s snow guns and piping were installed that enabled pumping of water from lake. 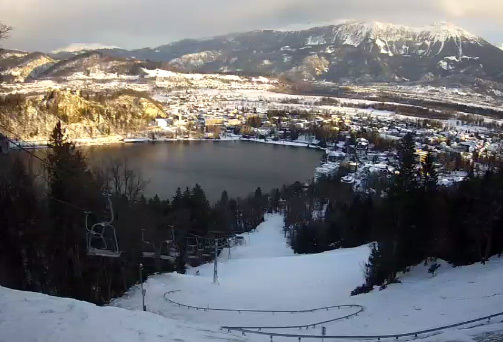 This has substantially improved and prolonged the ski season on Straža especially as other locations also had problems due to mild winters. 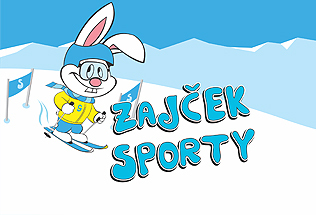 Facilities on the Straža Hill operated for many years only during winter. In 2005 the company Infrastruktura Bled d.o.o. financed the installation of the track for summer sledding that quickly became one of the favourite and well visited summer attraction. From that time the chairlift operates also in summer months. Ski slope operation depends almost entirely on the artificial snow- making due to mild winters. But weather conditions many times prevent artificial snow-making as too high temperatures of the lake represent one of the major issues. This is why a cooling system for cooling of lake water was built in 2006 that enabled more efficient compact snow making. The cooling system was renovated in 2013. In 2011 a company Koren sports d.o.o. built an adventure park along the upper station of the chairlift that is set up in the natural environment of trees.